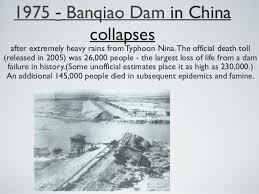 The Banqiao Reservoir Dam in Henan province failed in 1975 caused more casualties than any other dam failure in history at an estimated 230,000 deaths and 11 million displaced. The dam was later rebuilt. 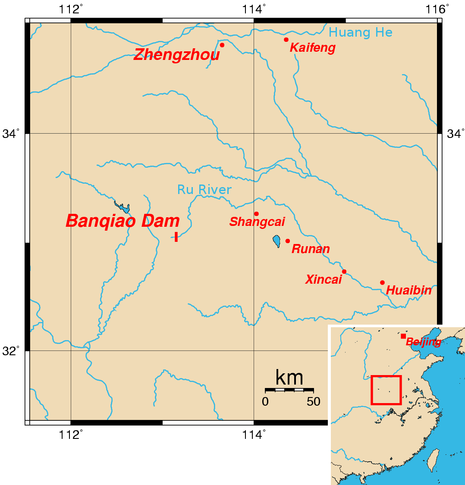 In response to severe flooding and to ensure electrical power generation, China built the Banqiao Dam in the Huai river basin of the Henan province. It was completed in 1952. However, they never imagined the dangers that would follow. Due to construction and engineering errors, numerous cracks in the dam appeared after completion and were repaired by Soviet engineers. Chen Xing, one of China’s foremost hydrologists, was involved in the design and was a vocal critic of the dam’s final construction as well as the government’s policy. Chen had recommended twelve sluice gates for the dam, but only five were installed. Chen was involved in other dam projects, but due to his continuing voicing of safety concerns related to design and construction practices, he was removed from the projects. In August of 1975, typhoon Nina pelted the region with the heaviest rains ever recorded in the area. More than a year’s worth of water fell in 24 hours. The previous record was 800 mm of rain, and the stalled typhoon Nina dropped a new record of 1060 mm in one day. The rainfall caused massive downstream flooding and, because of the flooded downstream areas, one request to open the dam was rejected on August 6. On August 7, the request to open the dam was accepted but this information did not reach the dam, as the storm had brought down the telegraph wires. The under-designed sluice gates were unable to handle the water volume. The water crested on August 8 at 0.3 m. higher than the protection wall on the dam, which failed. Shimantan Dam and 62 other smaller dams in the Huai river basin also failed. The Banqiao Dam failure caused a huge wave, 10 kilometers wide and 3-7 meters high to rush downstream at 50 kilometers per hour, inundating the lower area. One estimate is that 26,000 people died from flooding and another 145,000 died afterward as a result of epidemics and famine. . Some 5,960,000 buildings collapsed and 11 million residents were affected. Unofficial estimates of the number of people killed by the disaster have run as high as 230,000 people. The Chinese government tried their best to keep the accident a secret. By 1993 the dam was rebuilt, several meters taller. 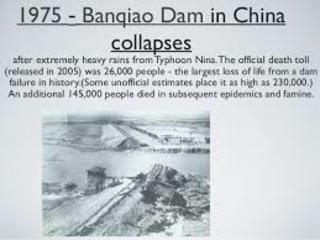 Since the Banquiao disaster the Chinese government became very focused on surveillance, repair, and consolidation of reservoir dams. Project Details The dam was completed in 1952 as part of a campaign to “Harness the Huai River” and its tributaries after severe flooding in previous years. During the 1950s, over 100 dams and reservoirs were built just in Zhumadian Prefecture of Henan Province along with Banqiao. When the Great Leap Forward began in 1958, the campaign was held up as a national model to “give primacy to water accumulation for irrigation." . The total capacity of the reservoir was 492 million m3 with 375 million m3 reserved for flood storage. The dam was made of clay and was 24.5 meters high. The maximum discharge of the reservoir was 1742 m3/s. Cracks in the dam and sluice gates appeared after completion due to construction and engineering errors. They were repaired with the advice from Soviet engineers and the new design, dubbed the iron dam, was considered unbreakable. Chen Xing (陈惺), one of China's foremost hydrologists, involved in the design of the dam, was also a vocal critic of the government's dam building policy, which involved many dams in the basin. The dam was designed to survive a once-in-1000-years flood (300 mm of rainfall per day) but a once-in-2000-years flood occurred in August 1975, following the collision of Typhoon Nina and a cold front. The typhoon was blocked for two days before its direction ultimately changed from northeastward to westward. As a result of this near stationary thunderstorm system, more than a year's worth of rain fell within 24 hours (1060 mm), exceeding the average annual precipitation of about 800 mm. The Banqiao Reservoir was designed with a capacity of only 492 million cubic meters but it had to accommodate more than 697 million cubic meters of floods, with half the recommended gates. Asking for help after the disaster had happened. It seems that news of the terrible event were silenced in China. Other The largest dam failure ever, over two hundred thousand deaths. Pathways for conflict outcome / response Little was done to repair the enormous environmental and social damage. This was the largest dam failure in the world. The dam was rebuit. Why? Explain briefly. After the failure of the dam and the tragedy, the dam was rebuilt. There was no possible compensation for hundreds of thousands dead or displaced. Patrick McCully, Silenced Rivers (description of the Banqiao disaster), p. 115-117. 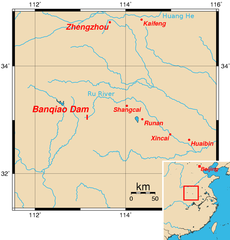 The Forgotten Legacy of the Banqiao Dam Collapse. 2013-02-08. The Economic Observer (with a summary of current development in dam building in China, 40 years afterwards).